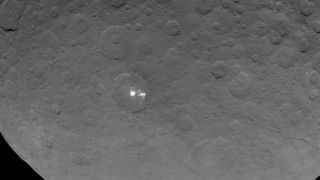 What Are Those Bright Spots on Ceres? Go Vote! The strange bright white spots on the dwarf planet Ceres are seen in this best view yet from NASA's Dawn spacecraft, which captured this image on May 16, 2015. The puzzling white spots on the surface of the dwarf planet Ceres are definitely reflecting sunlight, scientists said, but the cause of the marks remains a mystery. The newest batch of images from the Dawn spacecraft, which began orbiting Ceres on March 6, was released May 15. The data gleaned from these images has increased Dawn scientists' confidence that the white spots are caused by reflected sunlight, and that idea can help them narrow down the possible candidates for the spots' contents. You can vote for your favorite choice here: http://www.jpl.nasa.gov/dawn/world_ceres/. Scientists say the white spots on the dwarf planet Ceres are definitely reflecting sunlight. This wide view of the strange Ceres features was captured by NASA's Dawn spacecraft on May 16, 2015. "Dawn scientists can now conclude that the intense brightness of these spots is due to the reflection of sunlight by highly reflective material on the surface — possibly ice," Christopher Russell, principal investigator for the Dawn mission, said in a statement from NASA. Hints of the white spots on Ceres were seen almost a decade ago in images captured by the Hubble Space Telescope, said Marc Rayman, chief engineer for the Dawn mission. But prior to Dawn's approach of Ceres, scientists were able to say very little about what the white spots might be. As Dawn has provided increasingly better images of these regions, Dawn scientists have stated that the spots appear to be reflections of sunlight. The most recent images were taken at an altitude of 4,500 miles (7,200 kilometers) above Ceres and have a resolution of 2,250 feet (700 meters) per pixel. Ceres is the largest known object in the asteroid belt between Mars and Jupiter, and it is identified as both an asteroid and a dwarf planet. Its average diameter is 590 miles (950 km); its surface area would cover about 38 percent of the continental United States. Dawn is scheduled to get an even closer look at the spots when it enters a second orbit on June 6, which will place it at an altitude of 2,700 miles (4,400 km). Then, the spacecraft is set to enter into even lower orbits around Ceres, according to the mission website. Dawn still has more than a year of observing time around Ceres, after which it will depart for Vesta, the second most massive body in the asteroid belt. The mystery of the white spots is a tantalizing one, but it is not the central goal of the Dawn mission. "By studying Vesta and Ceres, we will gain a better understanding of the formation of our solar system, especially the terrestrial planets and, most importantly, the Earth," Raymond said on the mission website. "These bodies are samples of the building blocks that have formed Venus, Earth and Mars. Vesta-like bodies are believed to have contributed heavily to the core of our planet, and Ceres-like bodies may have provided our water."